So this week I have had broccoli with brown butter, brown butter ice cream from Mallards Ice Cream shop and now cauliflower with brown butter. My Mom had mushroom ravioli with brown butter sauce, but I watched her indulge, so that doesn't count. Try... so good and so easy. Bring a large pot of salted water to a boil and add cauliflower. Cook until tender, then drain. In a large non stick pan over medium heat, melt butter and swirl the pan until butter solids turn brown. 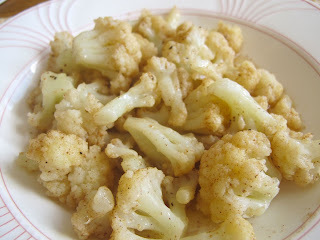 Turn off heat, add cauliflower to pan to coat. Squeeze a little lemon juice over top, if desired, and serve. Note: Cauliflower can also be roasted in the oven at 400F. instead of cooking in water.